The French investigation into the massive wealth of long standing Central African rulers and French allies may be changing the French model of neo-colonialism in Africa. 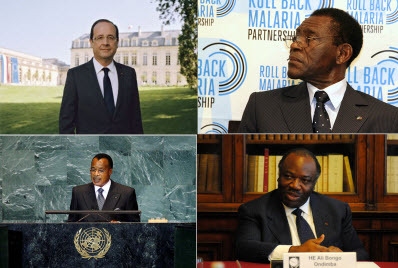 Clockwise, from top left: Francois Hollande, Obiang Nguema, Ali Bongo and Denis Sassou Nguesso. Photographs by Parti socialiste, Pablo Manriquez, Chatham House and United Nations. For three Central African leaders, the days of impunity and scandalous accumulation of wealth could be over, following an investigation by French prosecutors. The case of the ‘ill-gotten gains’ was first brought to court by two non-governmental organisations and an association of the Congolese diaspora in 2007. It aims to bring Central Africa’s most flagrantly corrupt leaders to justice for their alleged theft and embezzlement of public resources. 3 Francafrique, the source of all the misery? For now, two authoritarian leaders and one former head of state of small, oil-producing Central African countries are under investigation: President Denis Sassou Nguesso of the Republic of Congo, President Teodoro Obiang of Equatorial Guinea and the now-deceased President Omar Bongo of Gabon. Since 2007 these leaders have had much exposed about their lavish lifestyles. French investigators have revealed that between the three of them, the Central African leaders and their immediate families own 60 luxury properties in France, mainly in Paris, maintain tens of millions of euros worth of supercars, and hold over 200 bank accounts. Since the case uncovered the extent of the leaders’ wealth in France, prosecutors have been investigating how the funds were accumulated, in the hope of proving that the money was stolen from state budgets. Although Omar Bongo died in 2009, his son Ali Bongo is now the President of Gabon and the family is alleged to have retained the wealth Omar Bongo had previously misappropriated. As part of their investigation, French prosecutors raided one of the Bongo family’s 39 French homes in February of this year, but it has not yet been made clear exactly how the money was extracted. Ali Bongo, however, does seem worried by the scaling up of the investigation against him and his family and is reported to be in the process of changing his team of lawyers. Investigations of the Nguesso clan have been more successful. In July ‘ill-gotten gains’ investigators revealed that Nguesso had been using Franck Export, a French company based in Orly, to launder money, treating the firm like a personal piggy bank for him and his entourage. Their findings show that, amongst other dubious transactions, €9 million ($12 million) was transferred directly from the Treasury of the Republic of Congo to the company’s accounts between 2005-2011. Despite these findings, Nguesso continued to reject the notion of standing trial when he visited the Élysée Palace in June. As for the Obiang family, in July 2012 Judge Roger Le Loire issued an international arrest warrant for Teodoro ‘Teodorin’ Obiang, son of President Obiang of Equatorial Guinea, for his embezzlement of public resources. Teodorin appealed against the warrant, protesting that his 80-million euro pad was actually part of the Equatorial Guinean embassy. As his father had swiftly appointed him Second-Vice-President of the country following the issuing of the arrest warrant, he has tried to claim diplomatic immunity from prosecution. Teodorin, even by the nepotistic standards of the ‘ill-gotten gains’ case, is an example of outrageous opulence. When not rapping under his pseudonym, ‘Teddy Bear’, Teodorin tours the world, spending his money on supercars, a gulfstream jet and nearly two million dollars worth of Michael Jackson memorabilia. Between 2004-2011 he spent a dazzling $315 million on these and several other luxury items. Teodorin claims to have accumulated his spending money legitimately, yet his official government salary is just $6,799 per month, meaning it would take him over four decades to afford just one clock he bought. The chasm between his government salary and his lavish spending habits is reported to have been bridged by his cooperation with foreign timber companies – including the French logging firm, Isoroy – in manipulating logging contracts whilst he was Forestry Minister. In a breakthrough ruling on June 13, the Paris Court of Appeal rejected the request of annulment brought by Teodorin against the international arrest warrant. This judgement has allowed France to continue to seize assets under the guidance of ‘ill-gotten gains’. In July the state auctioned off Teodorin’s supercars for over three million euros. Although the case has received a recent setback as a result of Interpol’s anouncement this month that they will no longer support the arrest warrant issued against Teodorin beyond the Schengen zone, Teodorin can still be arrested by France in countries subject to bi-lateral extradition arrangements. The investigations against other members of the Obiang clan, as well as the Bongo and Nguesso families, continue. Francafrique, the source of all the misery? Despite the progress made by the case, there are fears that the shady political, economic and diplomatic ties between African rulers and their French counterparts, commonly known as ‘Francafrique’, and is believed to be the ultimate source of corruption, will continue. France has indeed moved on from a time when dictators in Africa bankrolled French elections, French intelligence agencies rigged the empowerment of chosen Francophiles (including Omar Bongo), and French firms that bribed officials abroad could deduct the price of the corruption as business expenses. Yet some believe that whatever progress the case makes, personal and business ties will continue to bind nepotistic French-African elite interests together. Hollande nevertheless seems determined to distance himself from past excesses of the French-African relationship, declaring in Dakar, Senegal in 2012 that “the time of Francafrique is over”. Yet, despite this claim, earlier this year Nguesso was welcomed in Paris to reaffirm the friendship between France and the Republic of Congo. Although Nguesso complained about judicial proceedings against him, the French Presidency stated that it “agreed to continue the development of economic relations between France and the Congo”. Behind cosy political friendships such as this, there exist longstanding economic interests. The French conglomerate Bolloré Group’s investment of €570 million ($750 million) in a container terminal at the port Pointe-Noire, Republic of Congo, was facilitated by a French Development Agency loan of €29 million ($38 million) in 2009 – an example of how financial interest can successfully blur the spheres of development and big business. To some, the intervention in Mali earlier this year is indicative of the continuing existence of Francafrique; the French desire for prestige, power and influence on the continent; and the failure of the ‘ill-gotten gains’ case to change anything but the French political narrative. However, Marie Rodet, Lecturer in the History of Africa at the School of Oriental and African Studies, believes that the conflict was in fact more of a practical decision. Rodet told Think Africa Press that “Mali isn’t somewhere where France has strong business links like in the Republic of Congo. The decision to intervene in Mali was circumstantial and based on the desire to fight against a brand of extremist Islam which had previously threatened France. Hollande wished to avert the destabilisation of West Africa and prevent a humanitarian disaster in a region so close to Europe”. Rodet believes that there has been a noticeable shift in the French-African relationship in the years since the ‘ill-gotten gains’ case began. She argues that “Although there are too many interests and the French-African relationship is too complex for it to transform overnight, there has been a shift of French policy towards the continent in the past two years. Hollande has clearly stated his desire for reform and the ill-gotten gains proceedings have shown that France is no longer willing to cover the illegal activities of leaders and families in the country”. However, Bourdon does not believe that the seized assets of the kleptocratic Central African leaders can be returned just yet to the populations from whom they were stolen. He argues that “Money recovered cannot go back to leaders who despise their own populations. We are not going to send money back to the beneficiaries of fraud. The money will only return when we are sure that the money will go towards the benefit of the population”.